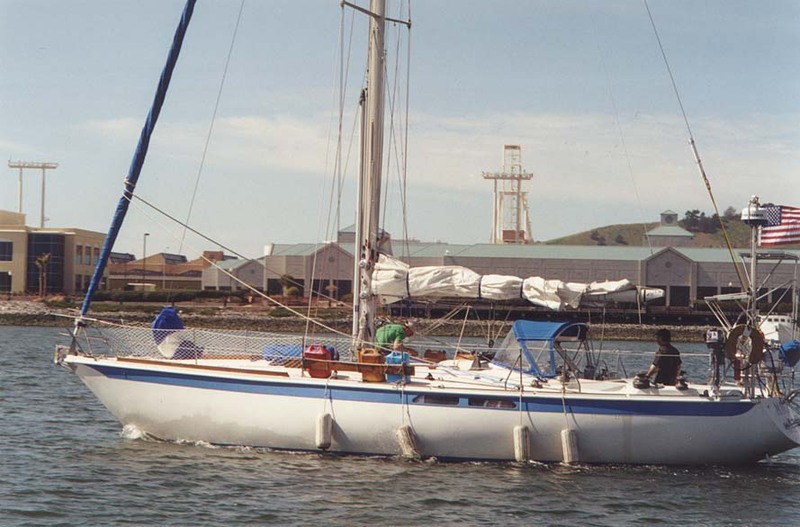 A mathematically inclined scholar of naval architecture has computed a number of performance parameters for about 250 popular cruising boats from Swans to Catalinas, using well-established standards of boat design and his own screwy system. His completely objective scientific conclusion: the Ericson 39 is among the very best cruisers ever designed. Though numbers may lie, it is somewhat reassuring for us to know that at the very least, according to some guy's idea of well established principles of stuff, we are not setting out on a weird nautical experiment. You can look this up on the web, but why bother. The boat was originally drawn as an ocean racer but by the standards of today's race boats is quite luxurious below. Unfortunately, this means more or less nothing, since even paint is considered too much extra weight these days. Maverick is quite Spartan in comparison to modern cruisers. She lacks hot and cold running water, refrigeration, a water maker, a microwave, a shower, a heater, a TV and VCR, and not a few other amenities considered essential for persons who do not live in the third world. That's where we're going, though, according to Terry. On the other hand she has received some significant upgrades from the original. These include increased tankage for fuel and water (about 72 gal. of each now), new Ballenger spars and rig, and considerably enhanced storage capacity for food and spares. We've added a dodger, Bimini, cockpit cover, inflatable tender, solar panel, radar, SSB, and a beefed-up charging system. We will carry a 44 lb. Bruce on 250 ft. of 5/16" proof coil spliced to 125 feet of 9/16" nylon and as our bower anchor and rode, handled by a power windlass. This is backed up by a 45 lb. CQR and 25 lb. Danforth for a lunch hook. All systems including the engine have been renewed. Well OK, not the rudder. We will have a laptop which, in addition to functioning as a terminal for email to you, dear reader, will receive weather faxes via the SSB radio and serve as a planatarium. We'll be able to look up worldwide trivia on two encyclopedias on the computer and edit digital photographs which we hope to send back home when we can get to an internet café. The Encarta encyclopedia includes recordings of all of the national anthems of the world, so we hope to play the appropriate ditty through the ship's stereo when approached by the local constabulary. This, along with a substantial bribe, may help keep us out of jail and by the by enhance America's image in the world, I should think. The skipper has just qualified for a General HAM license so the amateur bands will be available to us for further email, weather, and emergency communications, and we have two VHS radios for short distances. We have two Garmin GPS units and if they both fail we're carrying two sextants and the requisite tables, along with the standard navigation tools and charts. Steering will be done by a Monitor windvane while under sail and a Navico Wheelpilot 300-CX under power. Sail inventory includes a newish Hood main, older Hood 135% on a furler, a nondescript 90%, a new Hood storm staysail on a removable inner stay, a 3/4-oz. 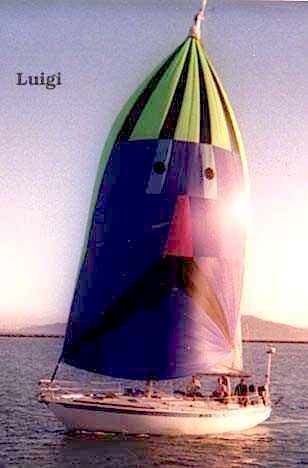 drifter/windseeker, and a new 3/4-oz Hood cruising spinnaker named Luigi. We're not scared, or anything, but safety gear includes an offshore liferaft with strobe, personal strobes, a strobe at the masthead, a strobe which is deployed with the man-overboard pole, and a 406 EPIRB with a strobe and GPS interface which in an emergency will emit a beacon notifying various agencies of a, like, serious problem. It'll be totally like the sixties with all those strobes going off. We'll have an extensive medical kit, and Terry's dentist gave him suturing lessons so brain surgery will not be a problem, so long as we limit ourselves to the part of the brain that has teeth. We'll carry a drogue, which slows down the boat if following seas make her surf at uncontrollable speeds, although what's wrong with that. We'll have an emergency rudder and an emergency tiller. There are alarms, flares, and fire extinguishers and other regulation safety equipment. In short, the boat has so much safety gear that the extra weight will no doubt prevent us from getting out of harm's way in the first place, thereby assuring its use; and here it may be relevant to mention that all of the gear we've listed was installed and will be maintained and operated by amateurs. Maverick has suffered with equanimity these various alterations, of which many place her squarely in the dowdy cruiser category. She has endured it all with the understanding that, at last, an adventure is afoot.